I have a lot of time on my hands at the moment, and today I decided to clean out some things in my bedroom. I came across a tote bag with a number of letters from way, way back when I lived in California foot loose and fancy free. I had driven cross-country dreaming of becoming an actress, gotten a job in a bank and was alone in an apartment without a TV, just an old radio, which played constantly. I guess that’s why every song I hear from that era throws me right back to those California days and that little studio apartment. New to the area with little money and knowing only a handful of people, I became a big letter writer to family and friends back home in New Jersey. Back in those “olden” days when cell phones and social media were just a far-off fantasy, and phone calls charged hefty long distance fees, letter writing was a way to keep in touch with loved ones. I feel like it’s a lost art. Mom and Peaches, the dog that never shuts up! I read through the letters and was somehow transported back in time. I became engulfed in a period of my life I had almost forgotten. People recounting their uneventful, day-to-day activities in writing made me feel less homesick. I imagined their laughter and felt their love and concern. A few old boyfriends I regret letting go of, some old friends, one of which I still keep in touch with. My family, and one letter in particular from my Mom dated November 12, 1974. It was the only letter from her I could find. I opened the beautifully scrolled paper, for my Mom had lovely penmanship, another lost art. She wrote that it was 7:35 AM, and she was writing a quickie before heading to work. She told me it was a miserable day, with rain heavy at times. She said the dogs were barking their heads off at the school kids, especially “big mouth” which was our dachshund, Peaches. Gigi, our pug/Scottie mix was the “good” dog. She continued that Peaches never shuts up between barking and eating! It brought a smile to my face. She told me she took a day off yesterday to wash the blinds and windows. She wrote that they still had their Sunday routine of church, breakfast and bargain shopping. She wrote about my brother having friends over. She asked if I had received my Christmas Club check from the bank – do those accounts where you put $5 or $10 a week in until October and then get a check to buy gifts still exist?! She enclosed some paper clippings of people we knew who got married. She also enclosed a small paper clipping with a little saying on it. She said she got the card I sent and that it was a tear-jerker and that my Dad said to tell me he wants our little girl to get home where she belongs. She said they both missed me – no doubt about it. She asked about my friends Then she wrote it was now 7:50 AM and by the time she gets those 2 dogs out and do a few odds and ends it will be time to run. 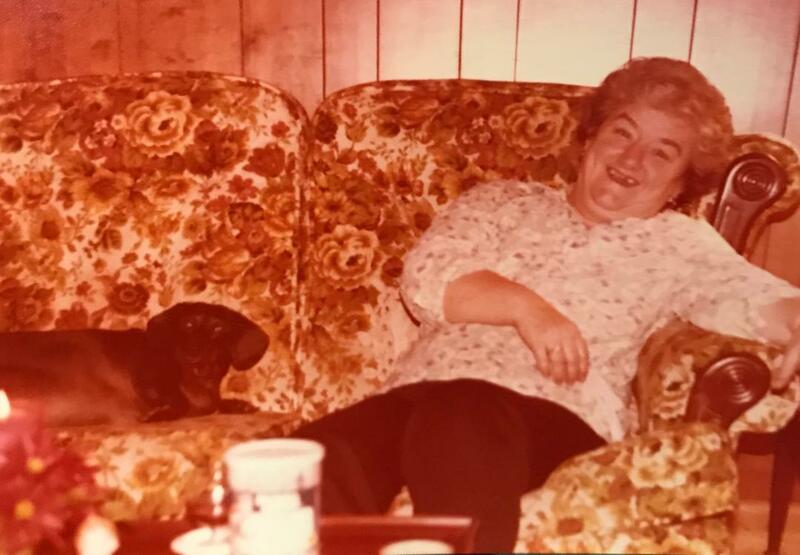 She took a bus to downtown Trenton every day to work at Dunham’s department store because she didn’t drive. Then she wrote the temperature was 51 degrees and again that it was cloudy and rainy. She said be good; God bless you. Love, Mom and Dad. So in the 15 minutes between 7:35 and 7:50 she filled me in and made me feel closer to home, melting a little of the loneliness away. 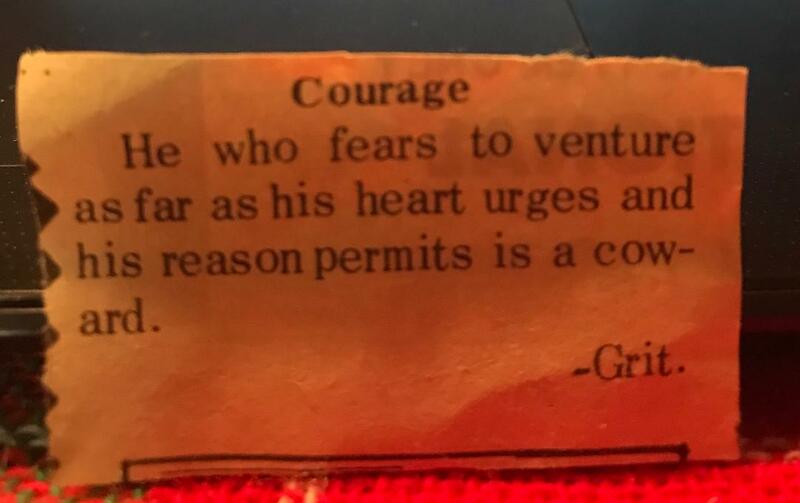 I found the clipping: COURAGE – He who fears to venture as far as his heart urges and his reason permits is a coward. I think she was complimenting and encouraging me for being brave enough at such a young age to venture out to a place I held close in my heart. California. Turns out I wouldn’t be brave enough to stay and pursue my dream. I was homesick and home is where I wanted to be. When I finished reading the letter, tears in my eyes, I felt I had visited with my Mom. She’s been gone for 22 years now, and for a short few moments I felt like I was with her again. I could envision my Mom and Dad in the house, running their Sunday errands, my Mom washing the windows and blinds, Peaches and Gigi sitting in the bow-window barking. I pictured her writing the letter at the kitchen table, mailing the letter on the way to the bus stop. I miss her, and my heart is aching. I want to go back and talk with her. I just wished I had made more time to spend with her. Finding this letter was a gift, and I’m thankful for all the love I felt reading between the lines of an ordinary life that meant the world to me. I agree Sue;. Regretfully, we take advantage of the things we will eventually miss! Yes, Karl. Especially this time of year.